Insulating roots on hot days. Hinders weeds from taking root. There are two basic kinds of mulch. 1. Organic materials include wood, bark, compost, grass clippings, and leaves. Organic mulch will decompose and improve the soil as they break down and decompose. 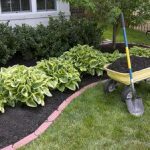 Over a few years you’ll need to add more mulch, in addition, organic mulches are easy to spread, and do no harm if mixed into soil. 2. Non organic stone and plastic mulches by contrast is meant to be a more permanent mulch. Non organic mulches are applied atop a layer of landscape fabric, and then left alone. It’s the lowest-maintenance option but not easy to work plant in. If you will be doing any gardening that requires digging and moving mulch aside to plant ornamental grasses or plants? You will want to stick with an organic mulch. Choosing the right mulch for your garden. Every kind of organic mulch has it’s downsides. For example, bark nuggets are can float away in heavy rain. Cocoa hulls have a distinct aroma, yet are relatively expensive, and toxic to dogs. Shredded bark or wood is the most common landscape mulch. It’s inexpensive and easy to apply, however doesn’t add many nutrients to soil compared to other mulches. Yard debris can used as mulch. You can also use debris from your yard as mulch, such as grass clippings, leaves, and compost. Grass clippings are effective as mulch, as long as you don’t apply too much or it will get soggy and sticky. Avoid mulch if the grass was treated with herbicides. Leaves are an excellent mulch if they’re shredded first. Pine needles are long lasting and an excellent mulch for plants like azaleas, because pine needles acidify soil. Calculating the amount of mulch you will need depends on your area of coverage and the depth you want. The following are standard coverage rates for a 2 cubic foot bag, a 3 cubic foot bag and a cubic yard.